Canary Wharf is the new financial centre located in the East End of London. It is worth visiting this outstanding example of regeneration which provides a first class working, shopping and leisure environment. It is a showcase of many modern architectural styles set in the old docklands environment. There are two large upmarket shopping malls providing a wide variety of goods, and there are numerous bars and restaurants. The shops and most bars and restaurants are open seven days a week until late evening. The park, retail and leisure facilities above the new Canary Wharf Crossrail Station opened in May 2015. The focal point of Canary Wharf is the tall white Canary Wharf Tower, this has 50 stories and stands 235 metres (770 feet) above ground level. It was the talles building in the Uk until The Shard surpassed it in 2010. Around Canary Wharf Tower are clustered other tall buildings mainly housing banking headquarters. The development provides abundant well kept green spaces and is surrounded by water with docks on three sides and the River Thames to the west. 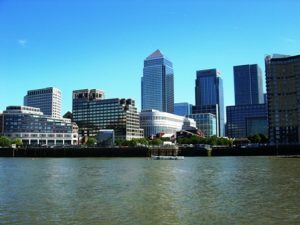 Canary Wharf hosts two large shopping malls providing a wide variety of goods with shops ranging from those selling luxury brands such as Tiffany and Breitling, shops with well known high street names and small designer boutiques. Most shops are open seven days a week until late evening. The main shopping mall stretches several hundred metres from the basement of the anchor Waitrose store on Churchill Place located to the east of the site. The mall runs under Canary Wharf Tower and Canary Wharf DLR Station to Cabot Square to the west. The two shopping floors above the main mall run east-west from the tower in the east to the DLR station and then from the DLR station to West India Avenue. 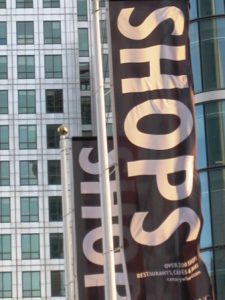 To the south, and separated from the main Canary Wharf mall by Canary Wharf Underground Station, is Jubilee Place. This is another slightly smaller shopping mall containing a Boots chemist, a Waterstone’s bookstore and many designer brand shops. Looking over the park from the west and on the ground floor is The Parlour, an all day bar and kitchen. It also boasts open air table tennis and an al-fresco bar. On the other side of the park, on the fourth floor above the Waitrose supermarket/department store and the Reebok Sports Club is the Plateau Restaurant. This restaurant is the one which has the most exceptional views of Canada Square Park. The parks and gardens of Canary Wharf host a range of plants set in innovatively designed landscapes with fountains, streams and works of modern art. To the east of Canary Wharf Tower is Canada Square Park which is primarily lawns surrounded by trees and flowerbeds, the park is home to a temporary ice skating rink every year in the winter months. To the south of Canada Square Park and above Canary Wharf Underground Station is Jubilee Gardens with trees, flower beds and winding walkways, streams and pools. 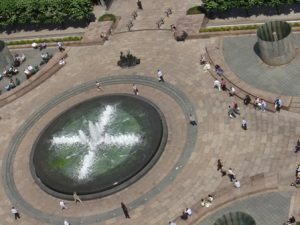 To the west of Canary Wharf Tower is Cabot Square with a large round fountain surrounded by formal planting, to the west of this a landscaped avenue leads away towards the River Thames and ends in a secluded circular garden close to the river. Canary Wharf hosts more than 100 art events every year. 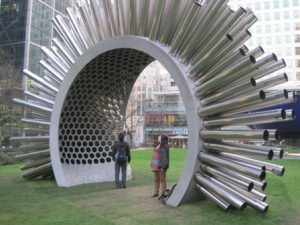 Currently on display in Canada Square Park (until 10 May 2012) is the Aeolus Acoustic Wind Pavilion (see picture) which is an acoustic and interactive sculpture which sings with the wind. It is made of nylon harp strings attached to 310 polished stainless steel tubes which direct wind and sound into the centre of the sculpture. 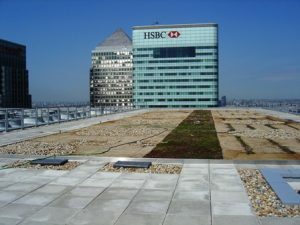 It must be embarassing to have to water the sedum mat on top of your 156 metre tall skyscraper with an ordinary garden hose, but that’s what Barclays Bank does on the roof of its corporate headquarters shown here. The sedum plants (which occupy the tiny green mat shown in the centre of the picture) are so dry because the wind at this altitude dries everything to a bone. Note also the little piles of stones on either side of the sedum mat These are intended as a habitat for any insect intrepid enough to get this high. Hmm – that’s some serious mountaineering for a little guy and there’s not much to eat apart from sedum. As a part of the planning application for the building Barclays got kudos for putting this stuff on the roof – there is a Building Research Establishment Environmental Assessment Methodology which gives points for this sort of thing. I don’t think they’ve thought it through properly!